Richard Hannay is bored and disgusted with the city life in London. Initially, it had been a sort of Arabian-Nights-come-true to live in the Old Country. But the pleasures of London had worn off well before a single month. As if in answer to his growing boredom, one day, he finds a man named Scudder in his house, who seeks refuge from dangerous enemies in Hannay’s place. Scudder tells Hannay an elaborate tale of how he was being followed and why his followers want to kill him. Hannay, happy that something exciting was happening to him, agrees to shelter Scudder till he was safe to leave. While coming back home from outside, a few days after, he finds Scudder murdered brutally in his house. When everybody assumes that he is the murderer, Hannay sets off on a escape-adventure posing as many different people and exploring the mountains and moors of Scottish terrain and fleeing from two different sets of pursuers- one, the London Police for whom he is a murderer on the run, and two, the Black Stone(the murderers of Scudder) for whom he is a man who knows the deadly secret that Scudder knew. Along the way, he unravels Scudder’s real mission with the help of Scudder’s black notebook full of coded clues. With the timely aid of many innocents such as a milkman, a literary innkeeper, a radical candidate and a spectacled roadman, he continues with his mission to accomplish Scudder’s job. I loved the part where he first meets the bald archaeologist and realizes that he is the dangerous man that Scudder narrated in his story. Hannay's shock at the realization and the desperate attempt to conceal his shock is most entertaining. 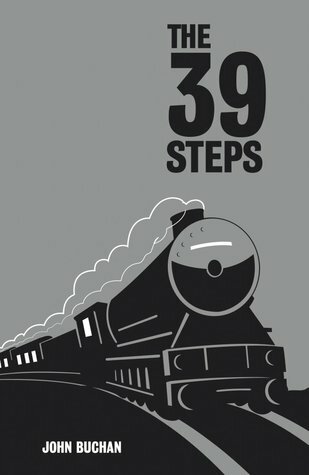 The 39 steps is a fast-paced book and is unputdownable. It is packed with action, adventure and thrill. The roller-coaster ride from Hannay’s monotonous life to one packed with suspense and mystery, is an amazing read!